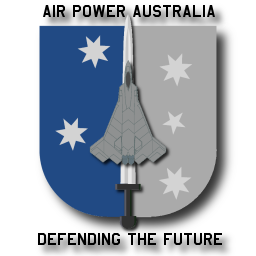 The founders of Air Power Australia welcome you to this web site, which has been designed as an educational resource for the public, the defence industry, and academic and military professionals. 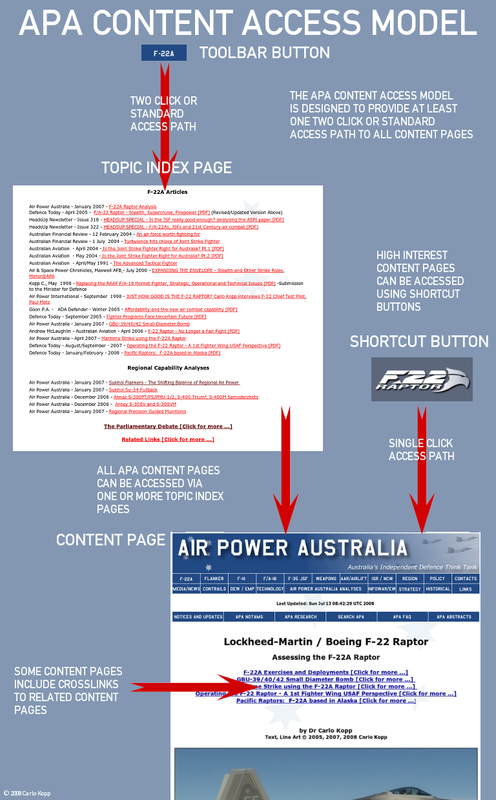 To familiarise yourself with Air Power Australia, its purpose, and this Website, we suggest the following for first time visitors, as a means of introduction, orientation and gaining the understanding for easy navigation through the vast amount of material this web site has on offer. Take the time to read through the Home Page. It will give you some idea of the Air Power Australia manifesto, the reason the web site was brought into existence, and our overall Aims, Objectives and Goals. We then recommend you read our research brief page which explains our research methodology, and also provides a master index of all APA Technical Report publications. 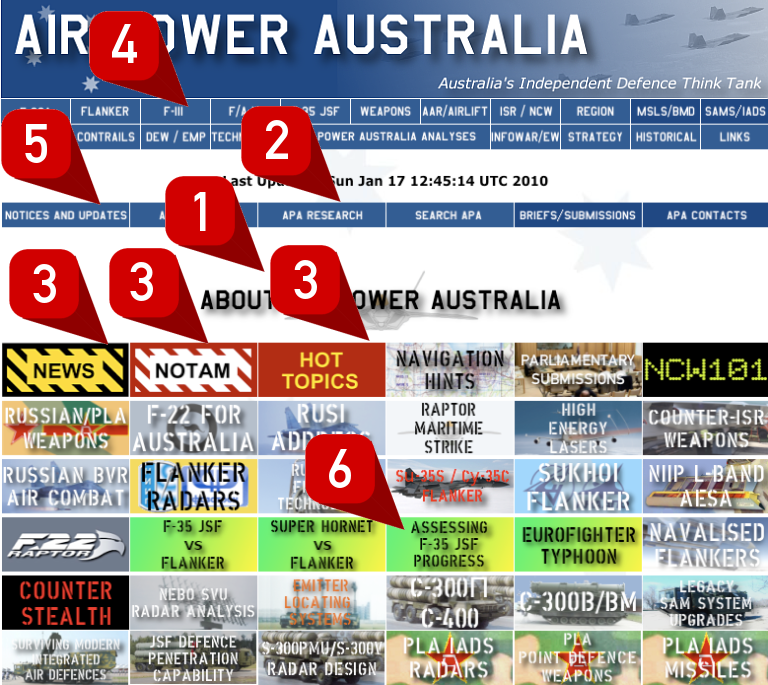 Then take the Media, Hot Topics and NOTAM shortcut buttons to browse through some of the latest material and Media Releases from Air Power Australia, as well as other players in the game of air power in our region. Once oriented to the purpose and the layout of this web site, you should find navigation quite easy, using the Main Toolbar, and the Auxiliary Toolbar or the quite powerful Search Engine Page to locate articles, papers, analyses and other material on specific words or topics. Don't be confused by the acronyms used in the button titles. Simply place your cursor over the button and its full title will appear. Once familiar with the Website and its layout, you can stay current with new content posted to the site by checking for updates under the Notices and Updates button. All APA content pages may be accessed via the Topic Index Pages through the Main Toolbar, and many high interest pages can be accessed directly via the shortcut buttons on the Home Page. The shortcut buttons to content pages were initially added in July 2008 to allow visitors not familiar with the Topic Index Pages to locate popular content quickly. The number has expanded since. The founders of and contributors to the Air Power Australia Website hope you enjoy this site and find the content beneficial, educational and rewarding. As of January, 2010, the APA website hosted no less than 324 PDF documents, 452 KMZ map reference files, and 520 HTML files. Excluding various test files and other unpublished material, this still leaves around 840 text content documents to find something in. Archived articles, briefings, papers or other publications of interest or value from a range of sources. The most common question raised by visitors is that of "why is item X in category Y?". Unfortunately, the problem of where to best categorise and locate a given subject is not always easily solved. In an ideal world, the subject pages would be placed into the very same categories as a visitor on the website expects them to be in. This would be easy if all website visitors had an identical mental map of topics and categories, and that map was identical to that of the webmaster! The problem of how readers categorise and contextualise material is one which humanities scholars have written many papers about, and will no doubt write many more about in the future. F-22A - all materials pertaining to the F-22A Raptor fighter. SUKHOI - all materials pertaining to the Sukhoi Flanker and PAK-FA families of fighters. F/A-18 - all materials pertaining to the 'classic' F/A-18A/B/C/D, F/A-18E/F and EF-18G. F-35 JSF - all materials pertaining to the Joint Strike Fighter family of aircraft. WEAPONS - all materials pertaining to Air to Surface Weapons including bombs and missiles, Cruise Missiles, Air to Air Weapons, Air Defence Weapons, Weapon Targeting Technology. AAR/AIRLIFT - all materials pertaining to aerial refuelling and airlift. ISR/NCW - Intelligence, Surveillance and Reconnaissance materials, and Network Centric Warfare materials. REGION - all materials pertaining to Asia/Pacific/Indian region military capabilities and strategies, Russian and Chinese weapons and systems, other than ballistic missiles and SAM systems. MSLS/BMD - Ballistic Missiles and Ballistic Missile Defence Systems. SAMS/IADS - Surface to Air Missile Systems, Integrated Air Defence Systems, air defence radars. MEDIA/NEWS - news archive, APA Media Releases, hot topics and related material for media visitors. CONTRAILS - reader feedback and correspondence pages. DEW/EMP - laser, microwave and other energy beam weapons, electromagnetic bombs of the nuclear and non-nuclear variety. TECHNOLOGY - all basic and applied technology topics, including radar, electro-optical sensors, weapon guidance, computing and Pilot Reports / Flight Training topics. INFOWAR/EW- all Information Warfare, Electronic Warfare, Electronic and Signals Intelligence related materials. 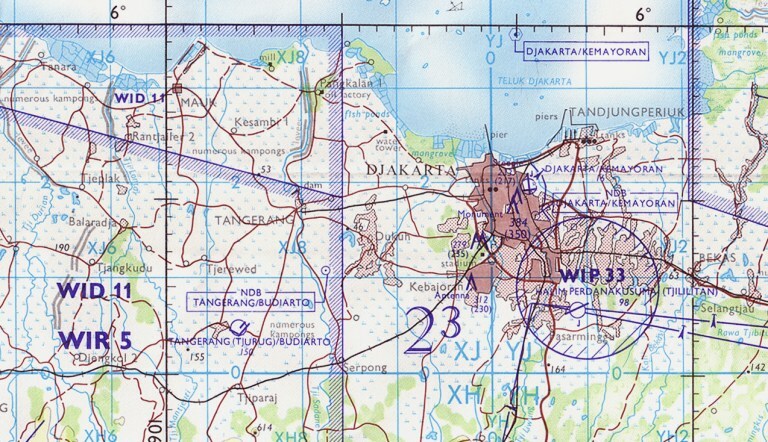 STRATEGY - all materials pertaining to military strategy and operations, and policy. HISTORICAL - historical topics especially covering World War II, the Cold War and other earlier conflicts, also some museum and heritage related materials. LINKS - links to other websites with related material or interests. NOTICES AND UPDATES - shortcut button for recently added content and update history. APA RESEARCH - shortcut button to APA research and policy statement, plus Technical Reports master index. SEARCH APA - Google search engine window. BRIEFS/SUBMISSIONS - shortcut button to briefings, slides and submissions. APA CONTACTS - APA contact details and contributor CVs. Home Page shortcut buttons to high interest topics. APA Abstracts page summarising many of the articles on the site (no longer maintained). Russian language Cyrillic title translations on many pages dealing with Russian equipment. In addition to this, most HTML pages have properly populated meta-tag entries for keywords and content, introduced since late 2006 to improve search engine targeting. Using the browser search window to scan the topic index pages, APA FAQ or APA Abstracts. Using the Google search engine and varying search terms. Look at the topic on Wikipedia as many subject pages include links to related APA website content. If these methods are not successful, it is likely that the material you are looking for is not hosted on the APA site, or the keywords or terms which have been used are not the same as the terms used on APA. The three largest index pages in terms of total link counts are SAMS/IADS, REGION, TECHNOLOGY and trailing them is the WEAPONS index. The most common visitor entry points are the Home Page, MEDIA/NEWS page and the NOTICES AND UPDATES page.